This article needs to be updated with material from Handbook: Major Periphery States; 20-Year Update; Shattered Sphere; FedCom Civil War. Once this title clears the Moratorium period, or if it already has, please consider revisiting this article and updating it with the new material, removing this tag once all information has been added. The Federated Commonwealth was the union of the Lyran Commonwealth and Federated Suns. The accession of Archon-Prince Victor Steiner-Davion in 3055 formally brought the nation into being, though in practice it had existed since before the Clan Invasion. Katherine Steiner-Davion seceded the Lyran half of the nation in 3057, creating the Lyran Alliance, which would lead to the FedCom Civil War in 3062. Victor abdicated the throne in 3067 and his successor, Prince-Regent Yvonne Steiner-Davion, renamed the rump Commonwealth "Federated Suns". In 3020, Archon Katrina Steiner of the Lyran Commonwealth issued a "Peace Proposal" to all of the Great Houses of the Inner Sphere; only First Prince Hanse Davion of the Federated Suns responded, and the two states began a long-running dialogue. In 3020 the two Successor States signed the FedCom Accords, a treaty which formalized military, scientific and economic exchange between the two states. However, included in the document was a secret provision, promising the marriage of Prince Hanse and Archon-Designate Melissa Steiner, which would unite the two in a vast political entity, the Federated Commonwealth. This provision would become known to the other States in 3027 during the Silver Eagle Incident. However, the Federated Suns and Lyran Commonwealth did not share a common border, complicating their eventual union. At the behest of Prince Hanse, to rectify this problem the two realms began increasing their military readiness and began training together for an eventual campaign of conquest, launching Operation Galahad. On 20 August, 3028, at the marriage ceremony of First Prince Hanse and Archon-Designate Melissa, with all the leaders of the Great Houses in attendance, Hanse made his fateful announcement: "Wife, in honor of our marriage, in addition to this morsel... I give you the Capellan Confederation!" With the launch of the Fourth Succession War, the combined forces of the Federated Suns and Lyran Commonwealth began a massive campaign aimed largely at the Capellan Confederation and the Draconis Combine. The war would end two years later on 10 January 3030 with roughly a third of the Capellan Confederation conquered, along with some 53 Combine and 13 Free Worlds League planets. The conquered worlds would be incorporated into the Federated Commonwealth as the Sarna March and form a corridor between the two halves of the new super-state. On 12 April 3030, Melissia gave birth to Victor Steiner-Davion, the future ruler of the Federated Commonwealth. While practically born in the aftermath of the Fourth Succession War, the Federated Commonwealth would only technically come into existence once Hanse and Melissa stepped down and allowed their son to assume his rightful position. Efforts were increased to further unify the two States politically and militarily in expectation of his ascension. Both the AFFS and LCAF increased work on combining their command structure, ranking system and battle doctrines into a single unified organization. On 13 March 3034, Haakon Magnusson declared himself Prince of the Free Rasalhague Republic which, in a surprise move, was agreed to by Gunji-no-Kanrei Theodore Kurita. The Combine's willingness to give up worlds to the nascent state would force the FedCom, and in particular the Lyrans, to do the same. Katrina Steiner had agreed at the onset of the Fourth Succession War to recognize the Tyr movement as the legitimate government of the Rasalhague worlds, yet most of their gains during the war had been in the Rasalhague Military District. To avoid appearing as hypocrites, the Lyrans agreed to relinquish control of these worlds to the FRR, effectively creating a buffer between the two States. This created discord within the Lyran half of the FedCom. While objections to the alliance was mostly confined to small extremist groups within the Federated Suns, it was much larger and more organized within the Commonwealth. The loss of men and material for what became almost no gain sparked anger and protests, especially within the Tamar and Skye regions. The First Skye Rebellion, started by separatists seeking independence similar to Rasalhague, would end after successful negotiations by Duke Ryan Steiner; these negotiations has the simultaneous effect of shaming Prince Hanse for seemingly overreacting to the crisis with the use of AFFS troops. This crisis would tie up FedCom forces and delay their expected attack against the Draconis Combine, originally planned for 3035, by several more years. Although it had been instrumental in facilitating the alliance, ComStar had no wish to see any one nation dominate the Inner Sphere, especially one dedicated to scientific progress. During the Fourth Succession War, much of the FedCom had been placed under a communications blackout, ostensibly in response to the Suns's attack on the HPG station on Sarna. Later investigations would exonerate the AFFS of any wrongdoing and suggest an underhanded plot by a third party; the same would be discovered regarding an apparent attack by the Death Commandos on the New Avalon Institute of Science. Only later would it be discovered that ComStar had been the one behind these false-flag attacks. In any event, FedCom was forced to accept the stationing of the Com Guards at all HPG stations, and a hidden war would commence between ROM and the combined forces of the LIC and MIIO with Operation Flush. Renewed conflict with the Combine was seen as inevitable, especially with both the Suns and Commonwealth facing political pressure not only to renew the conquest but also against the alliance in the first place. When Katrina Steiner stepped down as Archon on 15 March 3039 and her daughter Melissa took her place, the die was cast and preparations for the conflict began. The War of 3039 would start the following month, and end in December. What should have been a massive victory ended in a practical draw, with FedCom capturing seven planets to the Combine's three, far short of the projected forty to fifty worlds prior to the conflict. The delay in the start of the conflict had given Theodore Kurita time to revamp the DCMS into a more effective fighting force, while the AFFS and LCAF continued to fight as two separate organizations. FedCom communications were intercepted by the ISF, due to their recovery of a black box during the Fourth Succession War, which were lax in following encryption protocols. ComStar also assisted the Combine, secretly giving them BattleMechs incorporating advanced lostech from the Star League and preferential HPG rates, and indirectly through their hidden war with the FedCom intelligence communities. Finally, FedCom was unwilling to call the Combine's bluff with their final counter-attack, and signed the Exeter Accords in 19 January 3040. The war would highlight problems with the FedCom, which despite efforts still remained two distinct political, economic and military entities. Following the disastrous War of 3039, the FedCom would go through a period of rebuilding and integration. Learning their lesson from the war, in early 3041 the Armed Forces of the Federated Commonwealth was officially established. In order to eliminate confusion, the two militaries were reorganized into State Commands, one for each realm, with full authority over all troops within their area of operation regardless of origin. The LIC and MIIO was similarly grouped into the Intelligence Secretariat, which was charged with coordinating the disparate agencies under its command. The industrial and economic might of the two realms also helped them to recover swiftly from the aftermath of the war. The Skye March in particular was seen as an opportunity for corporations in both realms, such that in 3036 Archon Melissa was forced to intervene to prevent the exploitation of entire planets by greedy industrialists. However, FedCom's enemies also took the time to regroup: the Draconis Combine had proved itself more than a paper tiger, while the Capellans were eager to avenge their losses, and the Free Worlds League emerged from the Andurien Crisis with its house in order. A Fifth Succession War was seen as inevitable. In truth, for most of its existence FedCom was a joint venture between Hanse Davion and Melissa Steiner-Davion. With their deaths, the head of the Federated Commonwealth would formally be conferred onto the Archon-Prince, though this position was only ever filled by Victor Steiner-Davion for a couple of years from 3055 to 3057. Below him in the hierarchy would be the First Prince and Archon of the Federated Suns and Lyran Commonwealth, respectively, who would take over governing duties during his absence. The lowering of trade restrictions between the Federated Suns and Lyran Commonwealth would do much to strengthen their respective economies, especially after the Fourth Succession War and War of 3039. The conquest of fresh territory would also help strengthen the business sector as corporations began to expand and grow into these new markets. This led to massive exploitation, such that in 3036 Melissa Steiner-Davion had to step in and put an end to their unfair practices. In the years afterward, most effort went towards strengthening local firms, such as the revival of Asuncion Industries. Trade with the other Successor States however dropped dramatically in the years following FedCom's formation. Only with the St. Ives Compact and Free Rasalhague Republic was FedCom an active trader, and even the latter felt constrained to keep economic activity with the new superstate at much lower levels for fear of offending the Draconis Combine. The Armed Forces of the Federated Commonwealth was the combined military of the AFFS and LCAF. By early 3041 AFFC High Command formally accepted control of the two organizations, and by 3042 the last vestiges of both militaries was discarded. 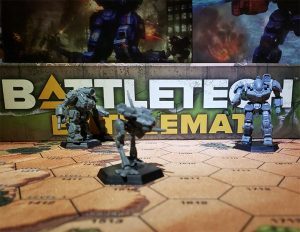 By 3050 the AFFC was the largest military organization in the Inner Sphere, with a BattleMech strength of 256 regiments and 1 battalion. This page was last edited on 20 February 2019, at 21:49.